If you are interested in LASIK eye surgery and wonder if there is an age limit for the procedure, talk to the top surgeons at Eye Consultants of Pennsylvania to discuss how we can best meet your goals and expectations. The LASIK and cornea surgeons at Eye Consultants of Pennsylvania are board certified and cornea fellowship-trained, which means they have undergone advanced courses of training under the guidance of experts in the field of corneal and refractive surgery. A Fellowship is considered the ultimate training for an ophthalmologist, and Drs. 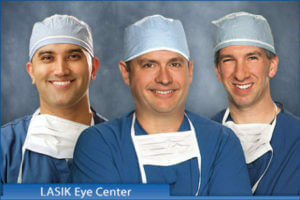 Altman, Primack and Shah are the only cornea fellowship-trained surgeons in the area. These three eminently qualified corneal surgeons prefer the custom Bladeless LASIK technique, also called “all-laser” LASIK, which modifies the curvature of your cornea using cool laser beams instead of a surgical blade. They are highly selective in choosing patients for Bladeless LASIK, extensively examining candidates and discussing their goals and expectations. Too Young for LASIK Surgery? LASIK eye surgery is FDA-approved for patients 18 and older. Our eyes are not fully developed until we reach adulthood. They continue to grow and change shape, and our vision continues to change into our early 20s. Having a stable prescription for at least two years is a sign that you may be a good LASIK candidate. In general, people between the ages of 25 and 40 are considered to be at the ideal age for LASIK surgery. Too Old for LASIK Surgery? After the age of 40, however, our vision may begin to change again due to age-related factors. The lenses become harder and do not change shape as easily as they once did. This causes light to focus behind the retina and results in our inability to focus on nearby objects. This is called presbyopia. It typically starts around the age of 40 or 45, and we find ourselves needing reading glasses or contacts to correct our vision. Presbyopia cannot be treated with LASIK eye surgery. If you are between 40 and 55 years of age and do not have presbyopia, LASIK surgery may still be an option depending on your medical history, eye health, and any family history of diabetes, glaucoma or corneal diseases. After the age of 60, you are at higher risk for vision loss due to cataracts and should first undergo cataract surgery to replace the natural lens of your eye. Cataract surgery does not mean that you cannot undergo LASIK later if you have otherwise healthy eyes. Other factors that may preclude older patients from being suitable candidates for LASIK surgery are dry eyes, a family history of corneal disorders, diabetes and glaucoma, and side effects from medications. Regardless of any age limit for LASIK eye surgery, your ophthalmologist at Eye Consultants of Pennsylvania will consider your overall eye health and any age-related changes in your vision when determining your candidacy for the procedure. Schedule a free consultation with us to discover if LASIK is right for you.